You always hear your dietitian say "Include salads in your meals" or "Have fruits everyday". Have you wondered why she keeps insisting on including salads? 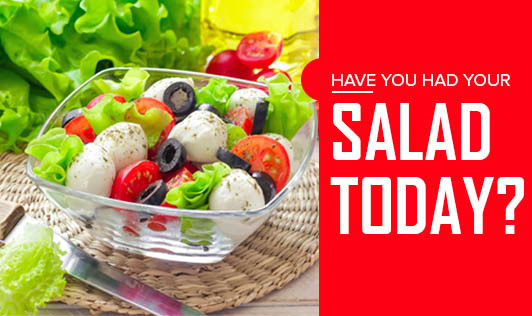 Read more to find out why salads are important. • Salads give you fiber: Vegetables and fruits give you plenty of fiber. The insoluble fiber found in vegetables adds bulk to your food which makes you feel full faster. The soluble fiber in fruits helps to reduce cholesterol levels. This fiber adds bulk to your diet and helps prevent constipation. • They are filled with micronutrients: Vegetables and fruits are loaded with vitamins and minerals which are essential for normal functioning of the body. They are also rich in antioxidants which protect your body against the effects of free radicals. • They add colour and texture: Fruits and vegetables come in so many different colours and textures! Including a variety of fruits and vegetables will not only make your food interesting, but also provides an array of health benefits. • Cuts down on calories: If you are watching your weight, then salads are the perfect addition to your diet as it cuts down on your total calorie intake. • Promotes absorption: Olive oil or avocado added to salads will promote the absorption of carotenoids, which are antioxidants that protect you from the effects of free radicals. • Helps you cut down on junk food: This is not only because it fills you up. Over a period of time, the craving for junk food will also be reduced. So, after all, there is a reason why dietitians say "Include salads in your meals"! Ready to eat one?